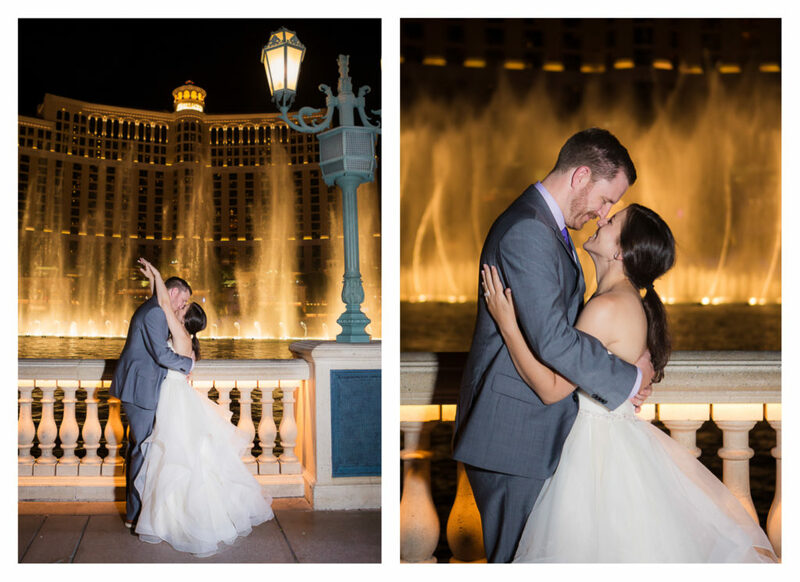 I had the chance to photograph one of my very best friends and her new husband on the Las Vegas Strip after their wedding at the Red Rock Resort. Melissa, the Bride, grew up in Las Vegas. I knew as soon as she got engaged that we had a Las Vegas Wedding in our future! Who doesn’t want to go to a Wedding in Las Vegas?!? She asked me soon after I took her engagement photos on Stanford’s campus if I could take her wedding photos on the Las Vegas Strip. OF COURSE! Typically, my favorite time of day to photograph couples is during that beautiful golden sunset hour, but I knew the Las Vegas Strip would be different. 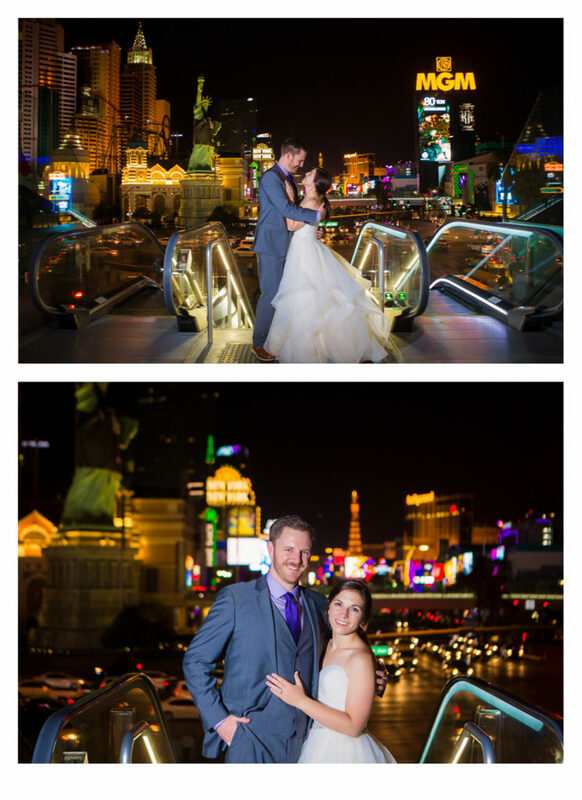 My favorite Wedding photos of the Las Vegas Strip were right after sunset and in the evening when you can really see all of the lights. Growing up in Las Vegas meant Melissa knew all of the best spots to photograph and had favorite locations in mind. I knew she loved the Bellagio Fountains (who doesn’t?!? ), and we would definitely take photos there. David almost proposed to her in front of the Bellagio Fountains but couldn’t find the perfect moment with all of the people around. He ended up doing it at her family home- I just love that so much more! I was a little worried about taking photos on the Las Vegas Strip with it being such a busy place full of people. I knew Melissa would love anything we captured, but of course I wanted to capture something EPIC! We were on the Las Vegas Strip! We started at Cosmopolitan in their honeymoon suite hotel room! What a room! This picture was taken from their hotel room balcony! We drove around hitting all of our favorite spots, and it worked out better than I imagined. All the tourists were so respectful and moved out of the way once they saw Melissa and David in their wedding attire. I think people enjoyed watching the romance happen too. Being on the strip always has something exciting to see. One big group chanted “Beso! beso!” in Spanish wanting to see the newlyweds share a kiss. The whole shoot was an experience and a really fun one! By far my favorite moment happened in front of the Bellagio fountains. The fountains were surrounded with people. I knew the spot I wanted, but I knew that was THE most popular spot by the Bellagio Fountains. Melissa being the brave and bold girl she is, encouraged me to go for the very best spot. So, we got in our spot, set up my flash and people moved out of the space and watched the magic happen! Cher’s song Believe came on and the Bellagio fountains gave us a great show with huge shots of water and lights with the water twirling around beautifully. Melissa and David danced together and really took in the moment. The photos turned out to be so much more than just a Wedding photo session, it really was an experience, and I enjoyed being there to capture it! 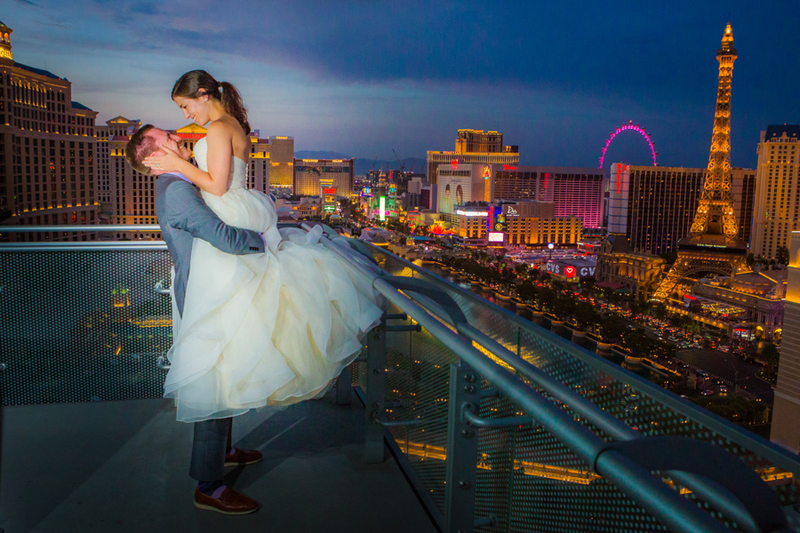 What an amazing memory as part of their wedding day in Las Vegas! 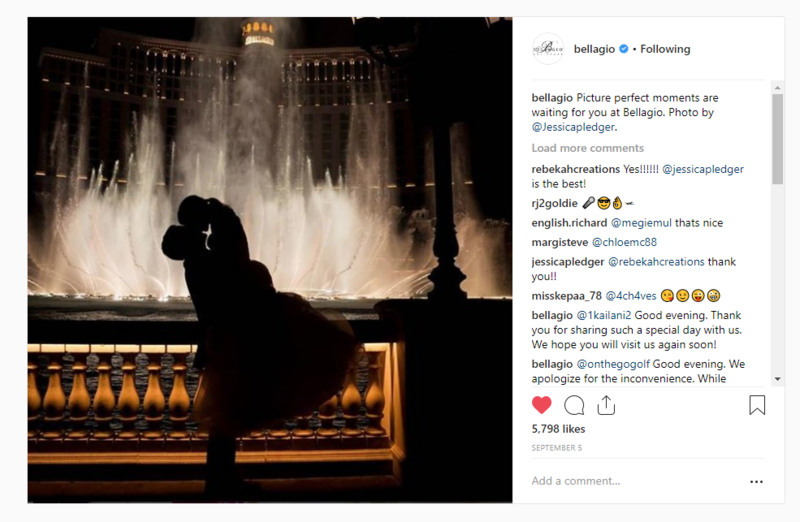 The Bellagio Hotel Instagram even shared one of the photos from our session and it received over 5,000 likes. If I had photos during the daytime, I would probably take more photos around the Bellagio Hotel, as well. They have such beautiful architecture, as well as Gardens. 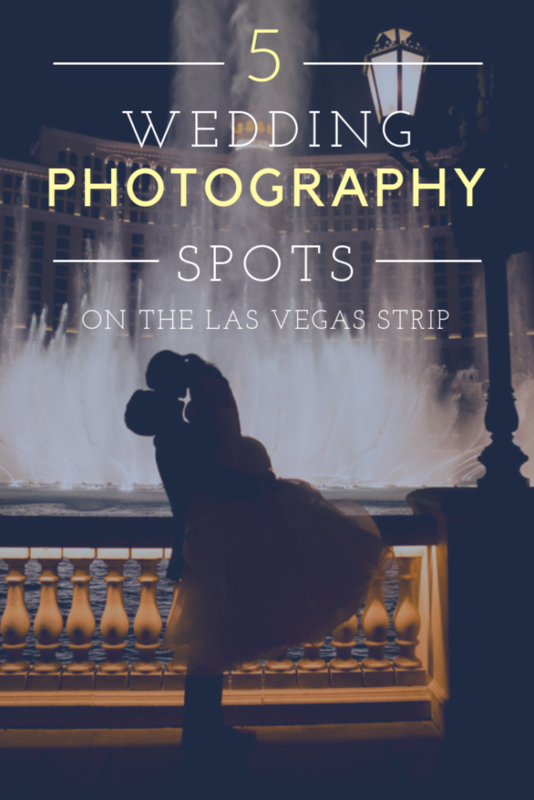 Almost all of the hotels have something cool to photograph on ground level, but the spots we hit were the Cosmopolitan Hotel Room, Welcome to Las Vegas Sign, Bellagio Fountains, and the above ground Walkway between the Excalibur and Tropicana! If I had to add one more, it would be a shot on Ground level or in front of the Cosmopolitan lights or inside the Bellagio in the daytime. Off strip, I would love to photograph in the Red Rock Canyon or Zion National Park!